To be successful in Real Estate you need listings and referrals. We can help you get both. In today’s market you need to stand out. I get flyers and postcards all the time from Realtors. They all look the same – Postcards with bulk mail stamps and pictures of them- BORING. Here are just a few ways many of our Realtor clients use our customized card service to send out cards. • Welcome to your new home with a picture of the family in front. Offer to send it to friends and family. • Thank you for your business with a $50 Hone Depot gift card. • Introduction to neighborhood businesses. This is something they will hang on to ! • Events in the area. Again, something they will hang on to. • Anniversary of their home. • The possibilities are unlimited! You’re sure to be the first person to come to mind when they or someone they know is in need of your service. Building a successful business based on referrals begs for a greeting card system like this to make it happen. I’d love to help you get started! 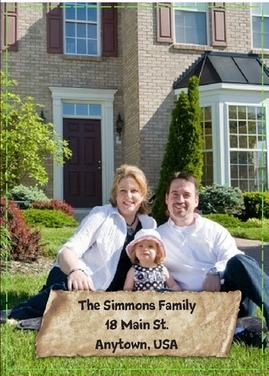 I have a campaign of customized cards specifically set up for Realtors at no extra charge. Fill out the form today and your campaign will go out tomorrow. Previous post: Have You Sent Out Your Valentine’s Cards?